How many brides-to-be would feel very unlucky if they did not receive a diamond ring, even a little teeny one, for their engagement? Here in the USA, as well as other countries, the diamond is taken for granted as the ring of choice for most women who are on the path to marriage. There is a lot of tradition concerning diamonds and diamond rings, both good and bad. There was a blurb on TV just the other day of a famous person that received a diamond in the rough as a present. It was an extremely large diamond. It turned out that that diamond was the result of lots of deaths and bad dealings. As a result of such hardships in the procurement of the diamond it represents bad luck. A typical Eastern superstition is that if one possesses an extremely large diamond is it always brings misfortune. There is a long history of intrigue, theft, blood and loss of life, loss of empire and other disasters that are associated with virtually all of those most celebrated large diamonds. Apparently, for the most part the stories appear to have a lot of truth to them. Because of that it tends to make a strong case in the superstitious belief that large diamonds are the cause of great misfortunes to their owners. Such high-profile large diamonds have shattered the lives of many of those that possessed them. Well that’s the unlucky side of diamonds for the most part although very long ago it was thought that a diamond in an engagement ring would surely bring bad luck because of interruption of the circle, which was a magic symbol of continuity. It destroyed the love and harmony which would otherwise have been eternal. That fear passed, however, and as now, the diamond became the favorite stone for the engagement ring. 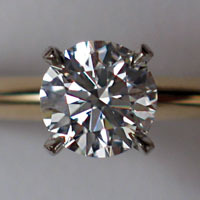 The sparkle of the diamond was thought to have originated in the fires of love. 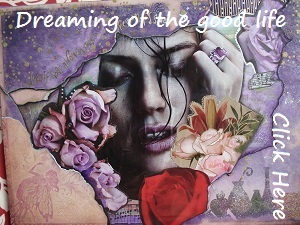 Due to this thinking, for anyone to wear this beautiful gemstone inspired love and constancy, to a great degree. As such, the story of Cleopatra giving Mark Anthony a diamond to win his love and affection is tribute to those thoughts. Another use for the diamond, born out of superstition was for those in the Near and Far East in the Middle Ages, was for an attractive woman to wear diamonds about her face to divert the Evil Eye’s admiration – with wicked intent – from her inherent beauty. 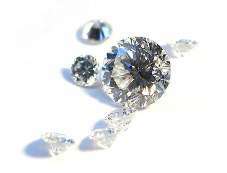 At one time superstitious people thought the diamond could propagate. So it became the custom to set two diamonds in one ring in the belief that at certain seasons they would produce other diamonds. If you ever wondered why the diamond setting in most rings let the stone touch the skin it comes from a very ancient belief that in order to exercise its full power the diamond had to be worn on the left or heart side of the body and be set so it touched the skin. The left hand was considered to be on the heart-side of the body. Whether you believe in the power of the diamond or not diamonds will be forever both lucky and unlucky, depending on the source and the person wearing the diamond.